Left of tree – in chair: Lenora “Kane” Marshall Crane b. 3/17/1871 (daughter of Jonathan S. & Nancy)--in her lap is Mary Margaret Crane b. 4/23/1897. 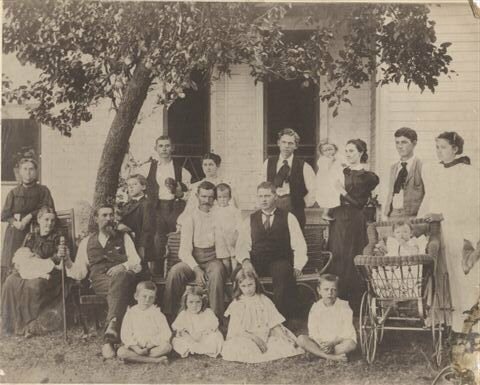 Back Row (Standing, left to right): William Thomas Presley Marshall b.1/25/1876 (son of Jonathan & Nancy); Amanda Terry Marshall b.3/1880 (married to William T.P. ); Alfred Marshall b. 8/13/1868 (son of Jonathan & Nancy); Aletha McCollum Marshall (wife of Alfred)--holding baby ?? ; Sam Gilkerson (married to Cora Ellen Marshall); Cora Ellen “Ellie” (Marshall) Gilkerson.